Carrot and zucchini go well when boiled; broccoli tastes better when steamed. A pumpkin a day--well, a bit of it, for it is too big a fruit, though not yet industrially grown-- keeps ulcer at bay. The salad-conscious cannot gorge on lettuce and cauliflower leaves in summer; in a tropical country like India, it's simply unnatural. Eat apples only in winter, and remember, local apples help fight scab better. Are you threatened by diabetes? Switch to germinated brown rice, a can-do-it-yourself. Food, what you eat 2009 on, begs a re-organisation of the palate that can only begin at home. Ever tried Novara rice? What about lingra? Apropos this vegetable, said a reader of our magazine, Deepak "There are many such nutritious wild edibles in the Himalayan region. Keep writing about such local delicacies." Thank you, Deepak. You are a true foodie. Heat a bit of mustard oil, add some uncrushed jakhiya (Cleome viscosa) or cumin seeds, whole red chillies and salt to taste. 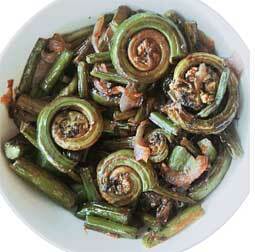 Add pieces of fronds and stir it till it matches your idea of being 'cooked'. Traditionally tribal communities in Garhwal, Kumaun, Himachal, Sikkim and Arunachal just stir and cook it alone or sometimes just boil without adding any spices, just salt, and eat along with mandua (Fagopyrum esculentum) chapattis or rice. The stir fry is the most popular in the region. One could also add potatoes, beans, carrots and mushrooms in the same recipe. Down To Earth will keep writing about such food.But there's no point in merely writing. India has to start re-savouring these 'nutritious wild edibles', and demand it. Common jute is good to hang over your shoulder, but its even better to eat, for it is calcium-rich, and the fibre in the leaves ensures no constipation (for recipe, see Down To Earth, November 1-15, 2008, p51). But paat saag has vanished. In an article on the changing food habits of the Yavatmal tribals of Maharashtra, our correspondent Aparna Pallavi asked "Why is the trend of consuming wild vegetables on the wane?" Her question is also a generic reminder of what has fallen off our palates. Millets and corn, once staple to India's drier parts, are two kinds of grains that got booted out of India's grain production map with the Green Revolution, but are healthier than wheat and rice. Next time you scan the supermarket store shelf looking for a good discount, remind yourself to ask for humble bajra. Better go off-the-shelf. Consider that umber, a variety of fig, is good for the stomach as well as general well-being. According to the National Institute of Nutrition, mahua flowers have twice as much calcium as grapes, four times as much as apples, and 40 times as much vitamin C. But both umber and mahua flowers are seasonal do not demand they be supplied all-year round. If you do, you will have lost the battle you must take to the processed food industry. Because ecosystems vary, what grows in them varies. Can this simple variety not become the basis of what we eat, beginning 2009? Food, what we eat 2009 on, begs a re-organisation of the palate that cannot only begin at home. It begs a re-organisation of where we source it from, and how. Vaasan, a wild leaf, can survive 14 years of drought; it is therefore revered. Can we be like vaasan, surviving a drought of junk, industrial food for 14 years to demand and put in place a change of habit, to therefore revere our health?